Melton Classics offers the industry’s largest selection of affordably priced column covers and column wraps in a broad selection of sizes, finishes and designs crafted in the finest low maintenance column cover materials available. You can select from column covers crafted in fiberglass, poly/marble fiberglass composite, GFRC, GRG, PVC, and wood. Our column covers have also been engineered to reduce installation labor, and provide simple and easy erection. To ensure we can meet the needs of any column application, we also offer a selection of our columns which are designed to be flexible so they can be used as both column covers and full round load bearing columns. We look forward to assisting you with achieving the design, application and budget goals you have set for your project by covering your structural steel or wood supports with our beautiful and simple to install Melton Classics column covers. Please call us now at 800-963-3060 for a consultation on how we can assist you with saving money and time with our Column Covers and Column Wraps. Column covers require the joining of the halves of the column covers which requires additional labor to install them over a load bearing one piece column shaft. This labor may be reduced greatly, or eliminated by the selection of the correct column covers at the correct time in the life cycle of your building project. Please contact one of your experienced Column Cover Consultants at 800-963-3060 for information on how you can save time and money by purchasing Melton Classics column covers for your project. Our column covers are available in an essentially limitless selection of designs. 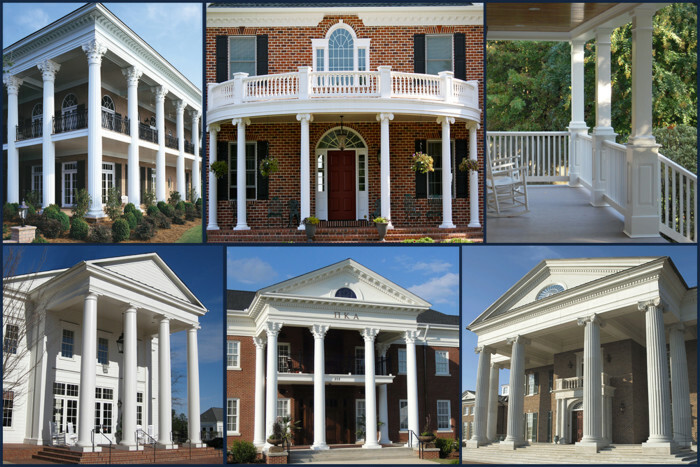 Our authentic classical designs are meticulously based on the Tuscan, Doric, Ionic or Corinthian Orders of Architecture and accurately reflect the classical beauty and elegance of columns from antiquity. In addition to our authentic classically designed column covers, we also offer column covers in contemporary, bungalow, and Craftsman designs. Our round column covers are offered straight or tapered with either smooth or fluted shafts. Our square column covers are available in smooth, fluted or paneled designs with straight or tapered shafts. We also offer a large selection of capitals and bases, from the ornate to elegantly simple, to enhance the beauty of your column covers. We are the industry leader in the custom manufacture of architectural column covers. In addition to our extensive selection of existing column designs, we can create your custom design at affordable prices. We also specialize in historical replications of designs. At Melton Classics, our column covers are crafted with impeccable quality by seasoned craftsmen in the finest materials available to allow us to provide you with the ideal column covers for your design, application and budget. From your first conversation with one of our experienced staff of column cover specialists, you will be guided from product selection and pricing through delivery and installation to ensure you have a pleasant and successful purchase experience. Please call one of our column cover specialists today at 800-963-3060 for a free consultation and quote. Thank you for your interest in fine architectural column covers and column wraps by Melton Classics!